In 1976 dr. Oliphant Jackson devised a ratio to determine the suitability of spur-thighed tortoises and Hermann's tortoises for hibernation. If a tortoise's Jackson-ratio is below a certain level, it is unsuitable for hibernation. I apply Jackson's method to measurements of Giant Asian pond turtles. To avoid confusion, I will use the phrase 'Body Mass Length Ratio' rather than 'Jackson-ratio'. The Straight Carapace Length (SCL) of a turtle is measured in a straight line along the (central) keel of the carapace. If you are using imperial units, you can calculate the ratio by dividing the weight in lbs by the length in inches to the third power, and multiplying the result by 27,68. My calculations are based on measurements provided by Peter Paul van Dijk, Sylvie Gaarová & Annette Justus, as well as data taken from publications by Jürgen Langmann (1987) and Michael Rudolphi & Ronald Weser (2000). 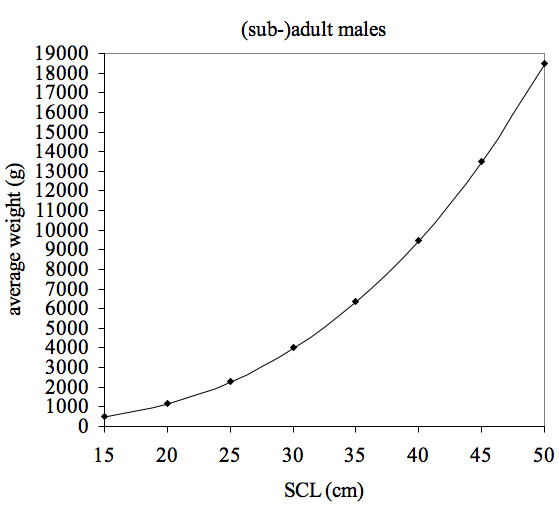 The average BML-ratio for captive males is 0.148, with a low boundary of 0.126 and a high boundary of 0.170. See table below. The low and high boundaries are calculated as average +/- two times standard deviation. 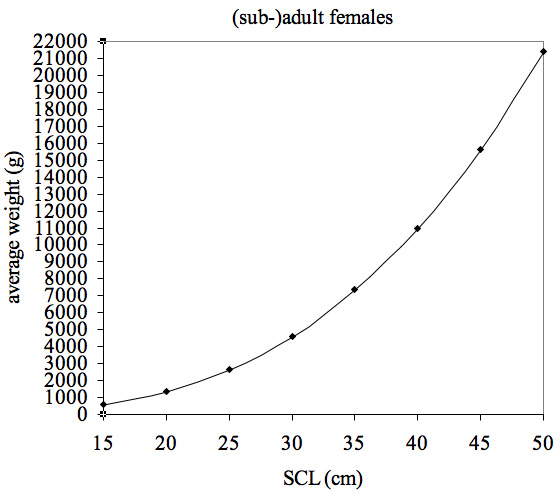 The average BML-ratio for captive females is 0.171, with a low boundary of 0.118 and a high boundary of 0.224. Females are on average heavier than males. And the range between the high and low values is larger than it is for males. This is because the weight fluctuates with the reproductive cycle: they gain weight when they develop eggs and lose weight when they lay them. With five measurements of two hatchlings I can only give an indication of the average weight of hatchlings (of up to 1 year old). See table below. Two wild females have been measured by P.P. van Dijk in Thailand. With a BML-ratio of 0.151 they were 12% lighter than an average captive female. They could have laid eggs just before being caught and measured and that could explain the 12% difference. In any case, no definitive conclusions can be drawn from only two measurements. I have no data on wild males. These numbers are purely statistical. They do not constitute a standard for optimal weight.